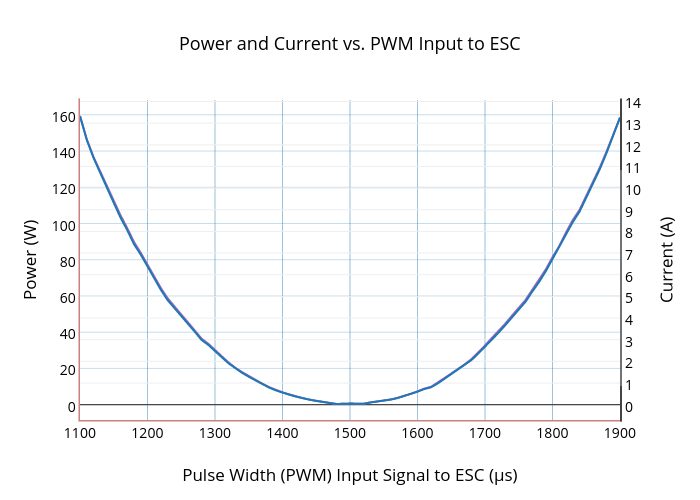 Rjehangir's interactive graph and data of "Power and Current vs. PWM Input to ESC" is a scatter chart, showing power vs current; with Pulse Width (PWM) Input Signal to ESC (µs) in the x-axis and Power (W) in the y-axis.. The x-axis shows values from 1100 to 1900. The y-axis shows values from -8.472222222222221 to 168.17222222222222.